Carolrhoda Lab (R), 9781606844380, 404pp. Lex Thomas is the author team made up of Lex Hrabe and Thomas Voorhies. Lex Hrabe was a Drama Geek in high school as well as student body president, but in spite of his affiliations, he probably wouldn't have lasted a week if his school had been quarantined. Lex received a BA in Drama and English from the University of Virginia and has worn hats as an actor, director, and writer. In addition to working as a screenwriter, he heads development at Cinespire Entertainment, a boutique production company (www.cinespire.com). 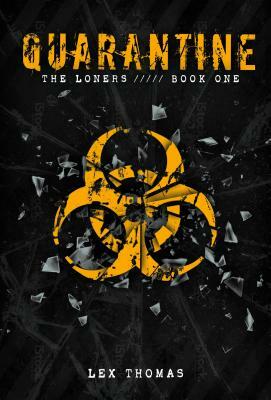 If Thomas Voorhies were a character in The Quarantine Trilogy, he would be a member of the Art Geek gang. Thomas graduated with a Bachelors of Fine Arts from the Rhode Island School of Design and continues to practice and exhibit his realist oil paintings. When he isn't writing or painting out of his home in Los Angeles, he is either watching movies, or watching even more movies. To see a selection of his artwork, visit: www.thomasvoorhies.com"